Often on our travels, we pass a weathered barn with a colorful quilt square emblazoned upon its side. It seemed random despite its obvious skill, and I became curious about what the story was. So I asked Google. Apparently this is a bit of a tourism draw, and North America has quilt trails in 43 states of the U.S. and 3 Canadian provinces. The first official quilt trail began in 2001 in Adams County, Ohio. 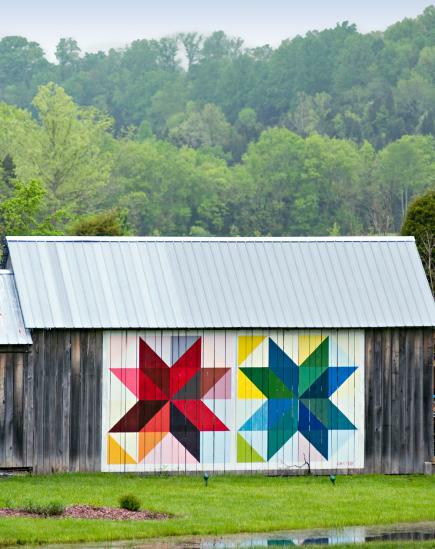 A woman wanted to honor her mother, an avid quilter, by painting a quilt square on her family's barn. This, coupled with the previously revealed Ohio Star barn quilt that was unveiled prior, became part of a "trail" that soon grew to 20. And today, though this is still emerging, these barn quilts are spreading rapidly. I must admit, their colors and unexpected appearances as we pass Midwestern farms do help break up the drive. It used to be that local artists were hired by an appointed committee to paint these quilts, but it became too time-consuming. Now, 8x8' wooden squares are created and hung on the side of familial barns. Such trails typically make up a single county, and while some you can walk to, most require a drive. And while only the community-driven projects are placed on the official maps, every quilt is considered to be part of the network. Most of the squares too are meaningful to the barn owner, whether it's pulled from an heirloom quilt or done so to honor a loved one. From my seat in the car however, as we continue down the lonely road, it's kind of reassuring to see them along for the ride.